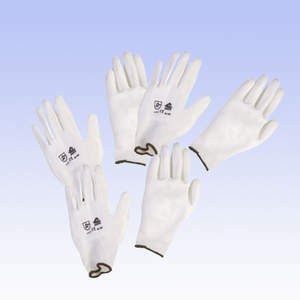 The Performa Lady Work Glove 251 is made of nylon, and the inner hand polyurethane coated. The Performa Lady Work Glove 251 provides a good fit. The glove is particularly resistant to abrasion and slipping. On the back of the glove is a ventilation panel that wicks moisture away from the hand and augments the breathability of the glove. One of our favorite features is the carabiner that clips onto rings in the side of the gloves so one can hook them on a belt loop or to our hip holster. The fingertips and palm in strategic places using a high tech synthetic called Toughtek, which holds up longer to abrasive activity and also grips well when wet or dry. The glove is suitable for precision and assembly work in dry.